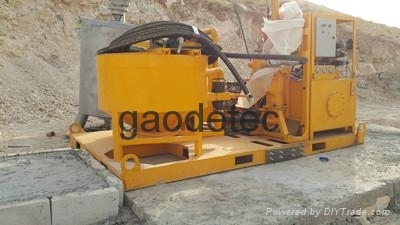 Gaodetec mainly supply diesel engine driven grouting and plasma plants in Asia, the Middle East, Africa customers. At the same time, according to the different grouting slurry pump factory, also have a single piston pump, double piston pump, piston grouting pump selection. So Gaodetec tens of thousands of type grouting equipment supply, can also be customized according to customer's requirements grouting device. 1. What type of grouting project will use grouting plants do? 2. What is your requirement of pressure and flow rate? 3. Motor or diesel engine? If the motor drive, what is the voltage at the construction site? How to find a good grouting equipment supplier in China, send email to info@gaodetec.com or make a phone call or send messages through whatsapp launch WeChat + 86-15903613994.